AV-OG-TIL, a Norwegian organisation focused on the development of alcohol-free zones, has commissioned what has turned out to be a global hit, “How to dock like a boss”. The commercial shows a couple enjoying a glass of wine while out in their boat with their children. While they smirk at the eccentric boatsman who docks his boat with style and precision, they struggle to bring their own boat in accurately. Docking is an art form best practiced sober. AV-OG-TIL (Off and On) is promoting the removal of alcohol usage from zones such as driving, sports and outdoors, boating and swimming, pregnancy, working and time spent with children and young people. While it is embarrassing to miss the the berth or run into the pier, this is not the worst thing that can happen at sea. There are many situations that require a skipper to be attentive and prompt in reaction, including navigating around driftwood, and other boat traffic, cooked engines or rope in the propeller. 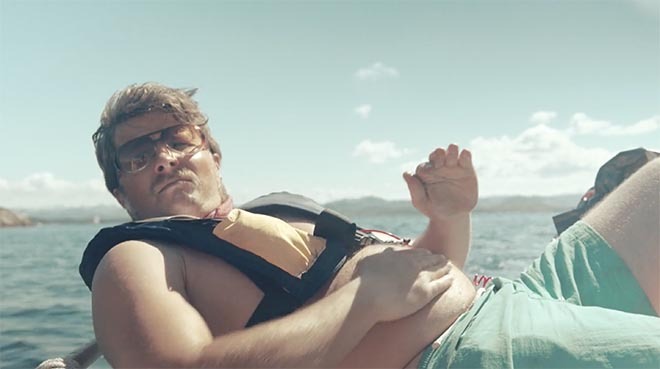 The How to dock like a boss campaign was developed at Melvær&Lien, Stavanger, by art director/copywriter Andreas Melvær, copywriter Knut Robberstad, and project manager Sissel Gorset. Filming was shot by director Arne Bru Haug with stylist and set designer Ann Kristin Bjørge, 2nd camera operator Andreas Bru Eide. Sound was produced by Håvard Rosenberg at Sweet Music. Music is “Who Knows”, by Jimi Hendrix, from Band of Gypsys album, featuring vocalist Buddy Miles, mixed by Italian producer Suonho. Cast are Jo Gill Næss (The Man), Vegar Hoel (Father), Kristin Melberg (Mother), Noah Gorset Kristoffersen (Son) and Marie Vestly (Daughter). Melvær&Lien are continuing with the popularity of their lead character in a spot marking the beginning of their summer break.